Is your learning content available in your desired language format? Is your mobile automatically synchronizes your learning activities and related information according to your location? Widespread use of smartphones at Workplace and Academic institutions has made learning “Anytime – Anywhere”. While sipping coffee at a cafeteria with colleagues, on a commute to an examination center, moving to a travel adventure spot, etc… examples are many more. Consider a situation where a group of children goes on a field trip to the museum. One of the children is equipped with a multimedia guide and they are discussing the museum architecture and exhibits. “ The main barrier to developing new modes of mobile learning is not technical but social. We have little understanding of context and learning outside the classroom”. As of now what we have understood is that Location-based mobile learning technology is one of the amazing use of mobile devices for learning in the real world. Learning content link could be accessed through an interactive media on mobile devices in real Geo-location and situations. Where should a learner take the leverage of the Location Based Mobile Learning? 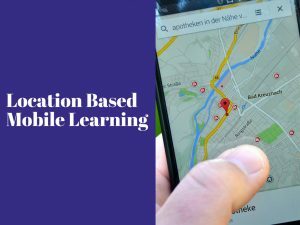 A learner can take the leverage of location-based mobile learning in numerous ways such as while driving to a new location or while eating in a restaurant. Field Trip – While traveling in different countries a guided companion to help you throughout the travel could be a mobile device. You can access information about a castle, museum, architecture, monuments, famous places etc. easily on mobile with the help of GPS enablement. With access to the location, mobile actually understands the pattern of searches and gives a recommended places to visit so that you won’t miss out to see the new things. Geo-location enablement not only gives you a better and non-hectic travel experience but also saves you a lot of dime expense on the guide. Location Based Feedback’s – Where do people spend their quality times with a loved one? In a restaurant or bar, enjoying and chilling out with family and friends. So, if a guided knowledge about the places to visit for food and drinks will actually save their precious mood and gesture about the place. People are actually interested in feeding the feedback forms, reviews and ratings of their visits, what they like and what they don’t like about the place. Multilingual Learning Experience In Corporate – Organizations whose spends are high in their employee training are taking the leverage of delivering their courses on mobile devices. For those businesses who are settled abroad faces a difficulty in delivering courses in their native language and scripts. This is where geo-location actually comes into the picture. Based on learners location, your online training course can be delivered in the preferred format. For example, implementing context-aware learning content in online learning, learners accessing online training course from China will mark a different online learning experience than the learners from New York. Learning portal, Content, Videos, Images and all sort of learning content will be accessible in their own language that will gain their learning engagement and experience and they won’t feel alienated through the learning process. Geo-location Based Social Learning – One of the most immersive and exciting experiences on online learning is virtual Geo-location experience. Instagram, Facebook, YouTube, Vimeo etc. channels are catering the images and videos platform to deliver the learning resource through geo-tagging the location and description. Educating about a place couldn’t be that difficult now as the social learning is delivering a virtual location learning arena. Readers, listeners, and learners can take the leverage to visualize the sights without leaving home. Just-In-Time Learning Experience – Remembering a small piece of instruction is better than a lengthy piece of info. Through micro learning, not only you can understand about the location at that point in time but not a big document and time spending learning experience. A corporate trainee can take the specific training resources based on their specific role and department through this mobile location enablement. Only a relevant source of information will be displayed based on their department location.